The Center on Budget and Policy Priorities is reporting States Face A Great Fiscal Crisis. At least 44 states faced or are facing shortfalls in their budgets for this and/or next year, and severe fiscal problems are highly likely to continue into the following year as well. Combined budget gaps for the remainder of this fiscal year and state fiscal years 2010 and 2011 are estimated to total more than $350 billion. States are currently at the mid-point of fiscal year 2009 — which started July 1 in most states — and are in the process of preparing their budgets for the next year. Over half the states had already cut spending, used reserves, or raised revenues in order to adopt a balanced budget for the current fiscal year — which started July 1 in most states. Now, their budgets have fallen out of balance again. New gaps of 42 billion (9% of state budgets) have opened up in the budgets of at least 41 states plus the District of Columbia. These budget gaps are in addition to the $48 billion shortfalls that these and other states faced as they adopted their budgets for the current fiscal year, bringing total gaps for the year to nearly 14 percent of budgets. 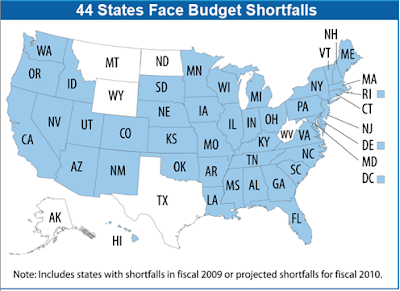 Some 44 states are facing fiscal stress in their FY2009 and/or FY2010 budgets. New mid-year fiscal year 2009 shortfalls of $42 billion have opened up in the budgets of at least 41 states and the District of Columbia. Budget deficits are already projected in 38 states for the upcoming fiscal year. Initial estimates of these shortfalls total almost $80 billion. As the full extent of 2010 deficits become known, shortfalls are likely to equal $145 billion. Combined budget gaps for the remainder of this fiscal year and state fiscal years 2010 and 2011 are estimated to total $350 billion to $370 billion. As bad as those numbers look, I suggest the numbers are overly optimistic. California alone has raised its budget deficit projection several times from $4 billion, to $8 billion, to $14 billion, and that is just for fiscal year 2009. 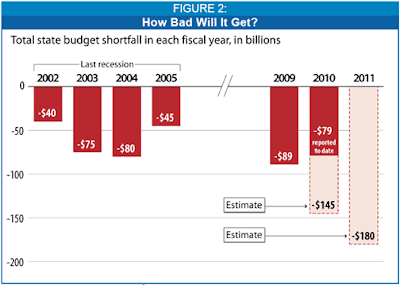 The California 2010 deficit is now projected to be $25 billion, a whopping 24.8% of the Fiscal Year 2009 General Budget. However, how can anyone have any confidence in the numbers when the projected deficit is revised higher every month? Remember that economists are expecting housing to bottom in 2009 and the recession is also expected to end soon followed by a weak recovery. Of course those same economists predicting a housing recovery have predicted a second half housing recovery for the last 3 years and most of them did not think the US would slide into a recession. I do not think housing prices bottom until 2012 given massive inventory and soaring unemployment. Furthermore, I expect any recovery will be exceptionally weak, assuming there even is a recovery. The key point is the trend is for worsening state budget projections, and there is no reason to expect that trend to reverse.